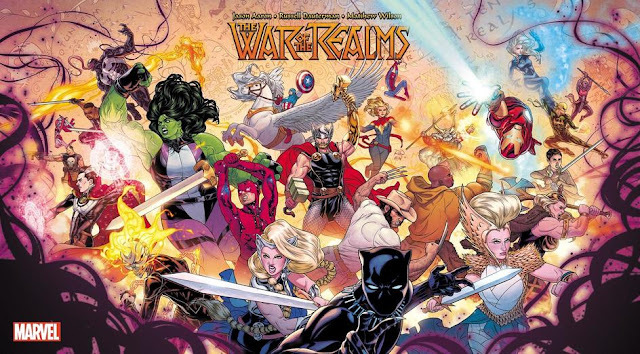 Welcome to the first installment of Comics Techniques and Tricks, an indefinite series in which we showcase techniques that only comics can do! Click here for the archive! 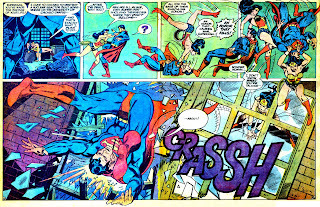 Today's Comics Technique and Trick comes from the Superman vs. Wonder Woman All-New Collectors' Edition, published in 1978, written by Gerry Conway and drawn by Jose Luis Garcia-Lopez and Dan Adkins! 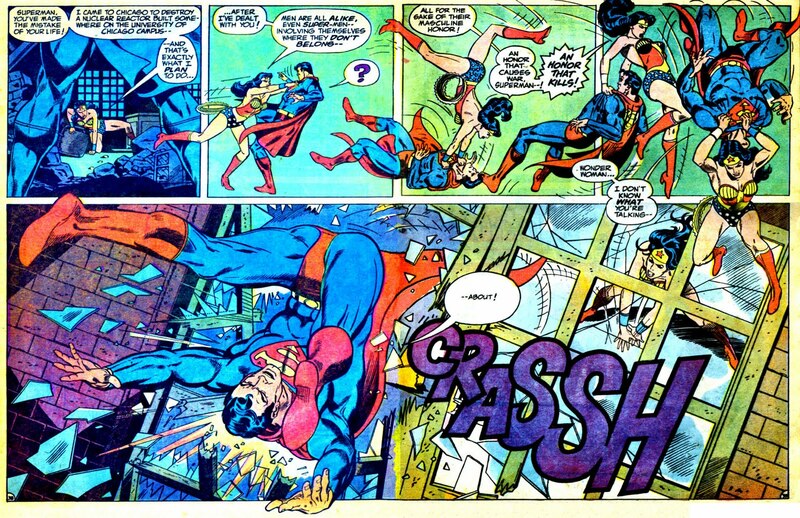 By retaining the uniformity of the panels on the upper tier of the page, Jose Luis Garcia-Lopez simulates a speedy motion by having Wonder Woman tackle Superman outside the confines of those panels. With four images of Diana tackling Clark taking place just over three panels, the effect is that the action is happening faster than the regular beat of the panels would have us believe! Note also how Garcia-Lopez places Wonder Woman at the bottom panel - our eye is instinctively drawn to her because the motion is so fluid. wow. that WAS good. good job, mr. garcia-lopez. It's also extraordinary that the last panel reads from right to left, contrary to common practices, and yet the art is very clear and easy to follow. Absolutely. The trick is to put the two Wonder Woman drawings close together! That is a very nice explication. The beauty of the artwork is that you read it and subconsciously take in the effect that you are pointing out; no attention needs to be called to it at all for it to work, and the artist isn't trying to pull off a "hey-look-at-me!" I wish I drew that well, and has such understanding of how to pull off tricks like that! Now if only Mr. Garcia Lopez could draw a monthly Wonder Woman comic book written by George Perez or Roy Thomas.